How Do Hummingbirds Flap Their Wings So Fast? This cuddly looking Panda was so excited about all the delicious bamboo he was eating, that it was hard to get him to sit still long enough to snap a clear picture. The panda exhibit at the Memphis Zoo is outstanding. The glass barrier allows you to get within inches of the pandas. This big guy was laid out on its back putting on a bamboo-eating show for the hundreds of visitors. Of all the pictures I took of the zoo creatures, I’m showing you the panda for a special reason. Pandas have a very unique thumb. Many years ago, a scientist named Stephen Jay Gould who taught evolution, said that the panda’s thumb shows that the creature must have evolved. He said that the thumb of the panda is very clumsy and is not well-designed. He argued that if God designed the panda’s thumb, He would have made it more functional and more useful, like the thumb of a human. Gould said that the poor design of the panda’s thumb proves an all-wise Creator did not design the panda. What Gould did not understand is that the panda’s thumb is perfectly designed to do the job it needs to do. Sure, the panda can’t use its thumb to write a letter or screw a lid on a peanut butter jar. But its thumb is ideal for holding bamboo. In fact, the “clumsy” thumb of the panda can hold bamboo in a grip so tight it is like a vice. 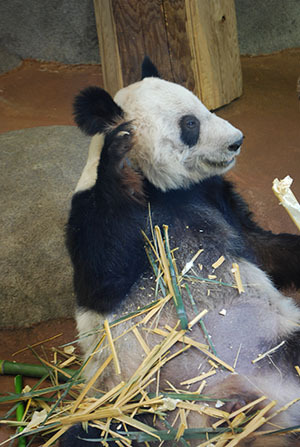 This allows the panda to strip the bamboo of its leaves and stem. That is good for the panda, because it spends about 12 hours every day eating about 50 pounds of food. In the wild, almost all of the food pandas eat is bamboo. They rarely eat anything else. We see then that their thumb is not an example of “bad design.” Instead, God designed the panda to have the perfect tool it needed to eat bamboo all day long.